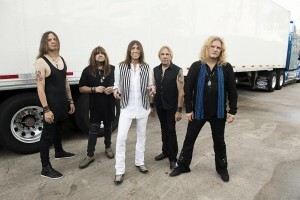 Tesla is once again gearing up to hit the road with longtime pals Def Leppard and Poison. The three-month North American outing sets sail this Saturday, April 8 in Manchester, NH. 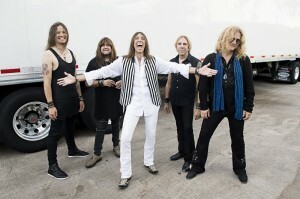 The pride of Sacramento, CA, the five-man band – now featuring original members vocalist Jeff Keith, guitarist Frank Hannon, drummer Troy Luccketta and bassist Brian Wheat, as well as guitarist Dave Rude – first busted out of California’s capital city with the 1986 release of their debut album Mechanical Resonance. Powered by radio hits and perennial concert classics “Little Suzi” and “Modern Day Cowboy,” the album set the stage for what would turn out to be decades of smash hits, unforgettable videos and powerful performances across the globe. With close to 15 million albums sold and countless sold out shows under their collective belts, the boys in Tesla seem to be getting’ better and better onstage and in the studio. 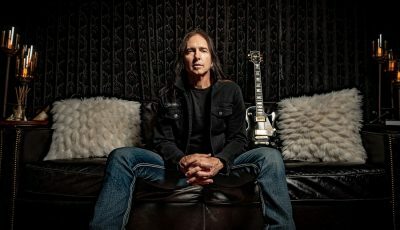 Earlier this week, I spoke with drummer Troy Luccketta and we chatted about the upcoming tour, the band’s forthcoming studio album, which is being produced by a guy whose name you will certainly recognize, and more. Troy, how you doing this morning? I’m doing great, Jim. I’m in the car driving. Can you hear me okay? I can. So far, so good. Are driving around town here in Sacramento? No, I live in Nashville, and believe it or not I’ve got a friend of mine who plays drums with Kenny Chesney, so I’m actually going to checkout a Kenny Chesney rehearsal. Nice! I would say I’m jealous but you know it’s not too bad here in Sactown. I love the Sactown! You know that’s my home, too. Absolutely! Well let’s talk about the topic of the day, here. 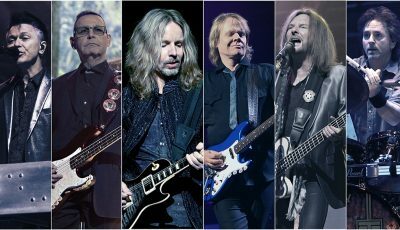 The North American tour with Def Leppard and Poison kicks off Saturday, April 8 in Manchester, NH. Do you recall the first time you met the guys in Def Leppard? I absolutely do. It was 1987 and we were playing in Amsterdam and we got to meet them and hung out. We knew that we were gonna do the Hysteria tour. So, we just kinda got connected and before you know it we were out on the Hysteria tour for like 15 months; all in-the-round. We did all of Europe, Canada, the U.S., and so we just became friends and had a great time on that tour, and now it’s 30 years later and here we are. You mentioned 30 years – I’m happy and proud to say that I just reached the 30-year mark in radio this year, so, yeah, many magical times. Congratulations, man! That is huge, as we both know, man, to be in this business this long and still have legs. (Laughs) Absolutely! So, I just spoke with Phil (Collen) yesterday, and of course one of the things we talked about was him being in the studio with you guys, producing the next Tesla album. What can you tell us about that project so far? Well my understanding is that we’re pretty close to finishing and wrapping it up. We did one track with him that’s on our (2016) Mechanical Resonance Live record and it was a song called “Save That Goodness” that Phil wrote and produced, and it came out really great. And then – I think it was his idea, I can exactly recall where the idea came from – of him doing the new Tesla record. His commitment to this has been so amazing because he’s in there, day in, day out, working. I am so grateful and so thankful for the fact that we have him heading this thing up. His work ethic is truly amazing! His commitment to what he signed up for is really what has impressed me. He’s completely all-in, 110 percent. All those years working with Mutt Lange and making those Def Leppard records, he knows what song structure is, he knows that nothing can be wasted and making sure that everything that we’re playing has a reason behind what we’re doing. There are no wasted notes or melodies. As I mentioned at the top of the conversation, the upcoming tour also includes Poison. To what extent, if any, do you guys get involved in putting this package together? Does somebody come to you, and say, hey, do you wanna do this with these bands? How does that work? Well, the interesting fact in all of this, and the thread through it, would be our agent, who also happens to handle Def Leppard, us and Poison. We have a relationship going back with Poison as well, because back in the day we did a tour with them. So, it’s like all of us coming back home. I’m really excited about this. I think it’s gonna be a great run, and it’s just gonna be a lot of fun. It’s a great bill – it’s gonna be a fun show. You mention going back in the day: let me take you back even further. What was the first concert you ever attended? Well, I’m from the Bay Area, so the first real concert I ever went to was at Winterland (in San Francisco) and it was Sha Na Na with Electric Light Orchestra – ELO – opening. Wow! There’s a bill, for ya! Yeah, it was awesome. It was pretty exciting. So, did you have that – what I call – proverbial, or in some cases, literal, Beatles On Ed Sullivan moment, where a record that you heard or a song came on the radio or a show that you went to, looking back now, that was the moment where you said, I wanna do that for the rest of my life? Oh, absolutely! I spent many a Friday night, instead of going to the high school football game and parties, watching those shows. The itinerary for the upcoming tour includes a good amount of smaller markets. You guys are road dogs, you’ve been just about everywhere, but are there some cities on this tour that you’ve never played before? Well, this is our third year with Def Leppard. In 2015 we had Styx and then last year we had REO Speedwagon. So, a lot of the reason we have some of those smaller markets is the fact that we’ve already been twice around, and so we’re hitting some of the smaller markets that we didn’t get to. So, as far as your question, nothing’s really jumping out at me. Thirty years into this we’ve been to most of these markets – Tesla’s been out pounding the pavement for a lot of years. But it’s always exciting getting back into the arena. All-in-all, it’s almost like bringing it back home. With Poison and Def Leppard, that’s just gonna be off the charts! Excellent! Well Troy, stay safe on the road, and thanks again for your time today. It was great talking to you. Hey, I hope to see you at one of the shows in Sacramento, man. I will be there! That’ll be a great opportunity to say hello face-to-face once again. And I’m looking forward to hearing the new album, too. Thanks, man. It’s been a pleasure. I look forward to seeing you soon. Alright, Troy, take care. Bye. An Interview with Up-And-Coming New York-Based Singer-Songwriter CHRIS LEAMY About His Breakout Single and His Social Movement #heplaysforme!! An Interview With NATHAN WEST About His New Band EAST OF ELI, Singing With His Wife, Actress Chyler Leigh and More!